It has begun! Our biggest DIY project so far. The MUCH waited for hardwood floors are going down and with that I am living in a construction zone for who knows how long. (Hopefully less than a week). 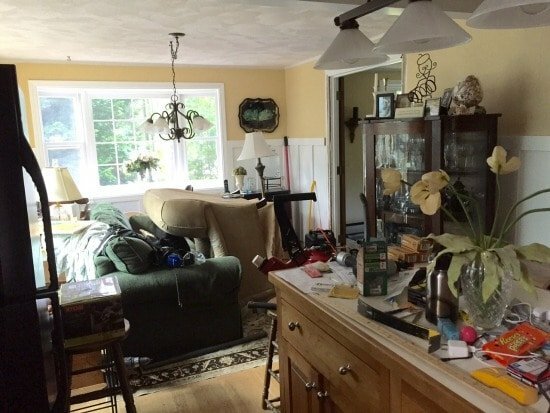 We are installing the floors throughout the entire first floor but decided to do one room at a time so we could move the furniture around as we go. 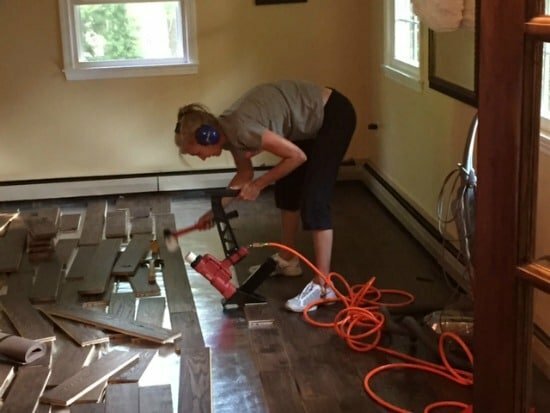 We did decide, after much pondering and research, that we wanted all new 5″ pre-finished planks instead of adding new unfinished 2 1/4″ planks to match the existing hardwood floors in the kitchen and dining area. We would have had to sand those and re-stain them. Plus, we just couldn’t figure out the dynamics of where to put all our furniture while sanding, staining, and 3 coats of polyureathane on it all. Wednesday night we moved the living room furniture into the kitchen and started ripping out the carpet. Who knew that could be so therapeutic! Then we removed the carpet tack strips, baseboards and a another ga-zillion staples just like on the stairs we stripped and painted. Just as we are finishing adding extra screws for squeaks into the subfloor of the living room, I glanced over at the kitchen and had a thought. 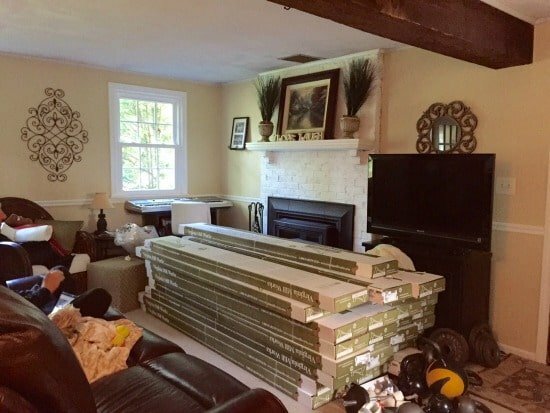 We needed to pull up a small area of those old hardwoods so we would have plenty of room to work once we finished the living room. That is when our visions of a smooth project completely ended. Under those hardwoods is another whole layer of plywood sporting the gorgeous old brown linoleum from 1978 PLUS a 3/4 inch difference in height from the living room and from the den on the other side of kitchen. Ugh! My husband and I just stared at each other. There was probably actual head scratching. I called my brother (aka my go-to for anything do-it-yourself) because he is so stinking smart. “What do we do?” I ask. 2 choices — add another layer of plywood to the living room and den (with a cost of about $500 bucks) or pull up those 2 layers of flooring (the cost of a ton of extra labor and a lot more time living my construction zone). After going back and forth and a trip to Home Depot to price it out, we chose option 2, loads more time and back breaking labor. Some of that 2nd plywood layer is screwed down! Yesterday, we lost a ton of time with all of our thinking and setting up tools (learning how to use them). 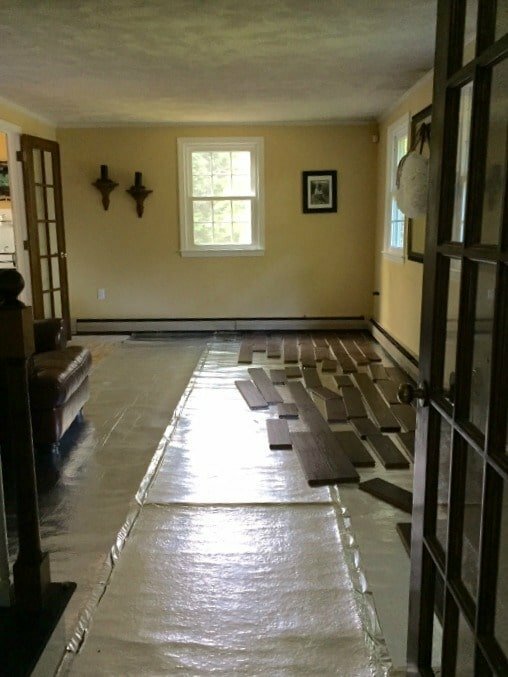 We did get most of the underlayment down in the living room thnakfully. Today has been so exciting seeing those lovely boards go down. I learned how to bang the heck out that fabulous nail gun thingy! Do not laugh at me! I’m praying for patience and more patience! Stay tuned for more pictures and updates.